Departement of Vaucluse - Pop. 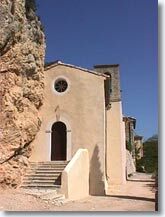 : 70 h.
Situated 18 km north of Carpentras via the D938, and the D78 (or the D7 and then the D90), between the Dentelles de Montmirail and Mont Ventoux. 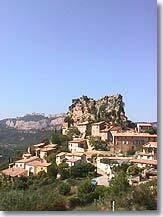 Like a sentinel perched on its rocky outcrop, La Roque Alric is right in the middle of the Dentelles de Montmirail. There are not many events, shops or activities, and that's exactly why La Roque Alric is such a charming place. When you enter the village, it feels as if you are entering a private residence. 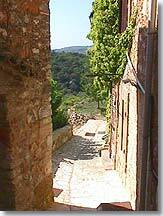 Walk up the steep alleyways to reach the church, at the highest point in the village. Here a viewpoint gives you a panoramic view of the Dentelles de Montmirail. The Rouviol district has the most inhabitants. A potter works there, and presents his wares in a workshop at Beaumes de Venise, close by. 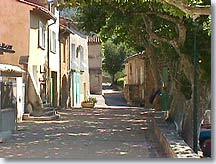 La Roque Alric is a small, picturesque, bright, clean and quiet village. it is the ideal place for recharging your batteries in the middle of a superb landscape, far from urban agitation. The panoramic view of the Dentelles de Montmirail. Lafare (4 km), Le Barroux (5 km), Beaumes de Venise (9 km), Carpentras (18 km).